The all-new show will take audiences on a musical and visual journey which will see each album track performed with authenticity, passion and accuracy. In addition, the show will provide insight into the complex and multi-layered themes behind “The Wall”, leaving audiences with not only a breathtaking concert experience, but also a deeper understanding of composer Roger Waters’ messages and motivation in writing this unforgettable musical masterpiece. The show will tour extensively throughout Australia’s capital cities and regional centres and will engage the community in each town with young local performers to provide the memorable “Another Brick in the Wall Part 2” choir. Formed in 2009 and with thousands of hours of rehearsal and live performance behind them, Echoes of Pink Floyd comprises a six-piece band featuring Daniel Hunter on lead guitar; Jason Miller on drums; Mark Dole on bass; Paul Bindig on keyboards and synthesisers; Mark MacNab on rhythm and acoustic guitar and Matt Goodluck on lead vocals. The band’s aim is to authentically replicate the brilliant sights and sounds of one of the world’s greatest progressive rock bands of all time, Pink Floyd. 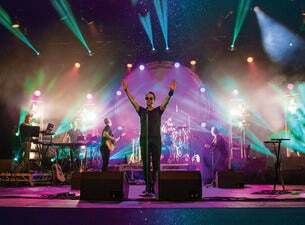 The Adelaide-based tribute has been touring nationally since 2014, with audiences describing the show as “amazingly awesome” and “a musical and visual journey that never disappoints”, whilst also likening them to “the original band”. Echoes of Pink Floyd has also achieved critical acclaim with the music press describing them as “the next best thing to a genuine Floyd experience” [Bendigo Weekly], “a skilful celebration of the source material” [Upside News - Adelaide] and “a true credit to the musicians” [Rogue Inc - Perth]. Echoes of Pink Floyd tour with a 4-metre light circle upon which a video show is projected at 6000 lumens’ intensity. The band perfectly synchronise their playing to the visuals to complete an experience that delivers the sights, sounds and emotions of a genuine Pink Floyd concert. Echoes of Pink Floyd’s Daniel Hunter says, “Each member of the band loves and respects what the original Pink Floyd gave to the world with their music. We want to bring this to life for the audience who may not have had a chance to experience a Pink Floyd concert, or wish to relive memories from their youth. “We aim to ensure every aspect of the original Pink Floyd music is captured authentically,” he adds. Drummer Jason Miller says, “At core, we are looking at the legacy of the music. Our vision and desire is to keep this music alive so it will be remembered for generations to come. We want to stand up as the next representatives of these guys in the 21st century, by being the truly authentic Pink Floyd concept show for Australia”.